Despite plugging our May performance by found-sound electronic duo Matmos (here), I’m not all that familiar with the group. But this new interview by the Daily Californian offers a fascinating primer on their thinking and music. Known for creating soundscapes using found objects (a taxidermied deer head, the pages of a bible), animals (rats scurrying in a cage), and actions (liposuction surgery), the pair’s conversation ranged from Drew Daniel’s love of American punk (he tells how the Germs’ drummer agreed to burn Daniel’s skin with a cigarette “and we recorded the sound of my cry of pain and the sizzling sound, and then manipulated that into a piece”) to the dematerialization of music (“instead of buying records and looking at the art, people are getting music that streams into their hard drive, they have it for a few months, and then throw it away”). DC: What initiated your mutual interest in found sound amd field recordings? DD: When I was a kid, I had a mono jambox, a little tape recorder, and the mic inside it was broken. When I recorded my own voice, it was so distorted–it changed me from a little child into a scary monster. I liked that you could use recording to change your identity–it’s the musique concrete equivalent of feeling like Sauron when you’re playing heavy metal. 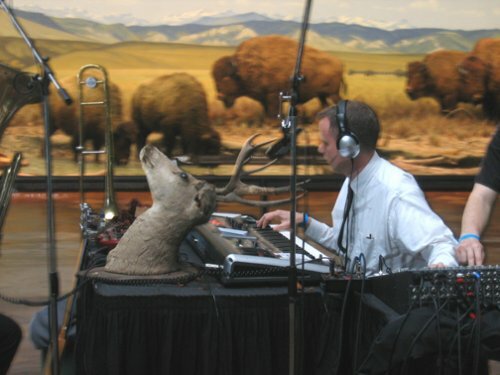 DC: With Matmos, the principle of composition is of the utmost importance. What sets you apart from other artists in the electronic or sample-based realm? DD: It’s a “ MacGyver”-like situation where you see what you can make out of what’s on hand. At that time in sampling culture, people were pigging out on James Brown breaks, and we started with something that wasn’t musically promising–a latex t-shirt, for instance. MS: At this point, we’ve been doing this for so many years that it affects other parts of my life: “ Can I clean the kitchen only using vinegar?” I think to myself, “ Okay, I don’t have to wear all yellow all the time.” Actually, I’ve never worn all yellow in my life before. DC: How do you decide that the more found-sound aspects of the music should be accompanied by more traditional instrumentation? DD: It depends on the song: there are certain pieces where we decide, “ Okay, let’s make this out of just one object.” As we’ve gotten older, we’ve gotten proggier and more pretentious. In the case of the new album, when you want to depict someone like Joe Meek, you want to use some of the kinds of instruments and playing that were important to him–that meant having a particular guitar tone. Other times, we’re pursuing an object as intensely as we can. In the case of making a song out of the skin of a rabbit, I tried to make 90% of the piece using just that rabbit, and then we brought in some environmental field recordings to put the rabbit in a space sonically. Matmos performs May 19 at the Walker with Brooklyn’s So Percussion and artist, instrument maker, composer (and former Walker staffer) Kitundu. Get tickets while you can.